Neville O’Riley Livingston is a singer songwriter and percussionist and was an original member of reggae group The Wailers along with Bob Marley and Peter Tosh. He is widely regarded as a musical legend and is considered one of the longtime standard bearers of reggae music. He has been named by Newsweek as one of the three most important musicians in world music. Bunny Wailer and Bob Marley were raised in the same household as brothers. Bunny’s father Thaddeus “Toddy” Livingston lived with Bob Marley’s mother Cedella Booker and had a daughter with her named Pearl Livingston. As he was by some way the least forceful of the trio, he tended to sing lead vocals less often than Marley and Tosh in the early years, but when Bob Marley left Jamaica in 1966 for Delaware, to be replaced by Constantine “Vision” Walker, he began to record and sing lead on some of his own compositions, such as “Who Feels It Knows It”, “I Stand Predominant” and “Sunday Morning”. His music was very influenced by gospel and the soul of Curtis Mayfield. In 1967, he recorded “This Train”, based on a gospel standard for the first time at Studio One. As the Wailers moved from producer to producer in the late 1960s he continued to be underused as a writer and lead vocalist, although he sang lead on “Riding High”, and on one verse of the Wailers’ Impressions-like “Keep On Moving, both produced by Lee Perry. By 1973, each of the three founding Wailers operated their own label, Marley with Tuff Gong, Tosh with H.I.M. Intel Diplo, and Bunny Wailer with Solomonic. He sang lead vocals on “Reincarnated Souls”, the B-side of the Wailers first Island single of the new era, and on two tracks on the Wailers last trio LP, “Burnin’” , “Pass it On” (which had been cut as a sound-system only dub plate five years earlier) and “Hallelujah Time”. By now he was recording singles in his own right, cutting “Bide Up”, “Arab Oil Weapon” and “Life Line” for his own label. Bunny Wailer toured with the Wailers in England and the United States, but soon became reluctant to leave Jamaica. He and Tosh became more marginalized in the group as the Wailers became an international success, and attention was increasingly focused on Marley. Bunny subsequently left the Wailers to pursue a solo career, which continues in the present. After leaving the Wailers, Bunny became more focused on his spiritual faith. 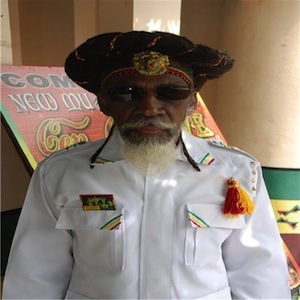 He identified with the Rastafari movement, as did the other Wailers. He has also written much of his own material as well as re-recording a number of cuts from the Wailers catalogue. Bunny Wailer has recorded primarily in the roots style, in keeping with his often political and spiritual messages. The album Blackheart Man is a good example of his roots reggae style, while “Sings the Wailers” successfully reworks many of The Wailers songs with the backing of top Jamaican musicians, Sly and Robbie. He experimented with disco on his album ‘Hook Line & Sinker’. He has also had success recording in the typically apolitical, more pop dancehall style. He has outlived his contemporaries in a culture where death by violence is commonplace. He was both the quietest and most spiritually creative of the Wailers. However, he also had a dancehall/Rockers edge that was best exemplified by the album “Bunny Wailer Sings the Wailers” in which he re-interprets some of the Wailers material as a solo Roots singer backed by a solid Sly & Robbie based Roots reggae grouping. The album was produced by him, recorded at Harry J studies. Some of these tracks are re-worked classic Wailers tracks (e.g. Dreamland – first recorded in 1970 with Lee ‘Scratch” Perry and released as a 7″ in 1971 with a U-Roy version on the B -Side). Another classic is Dancing Shoes, first recorded in the early 1960s as a driving Ska/Soul classic with Bunny Wailer as lead vocal. He has won the Grammy Award for Best Reggae Album in 1990, 1994 and 1996. Today, Bunny resides in Kingston and on a farm located in the interior of Jamaica (Saint Thomas), according to Bob Marley’s official website. Bunny Wailer and Beverley Kelso are the only surviving members of the original Wailers.